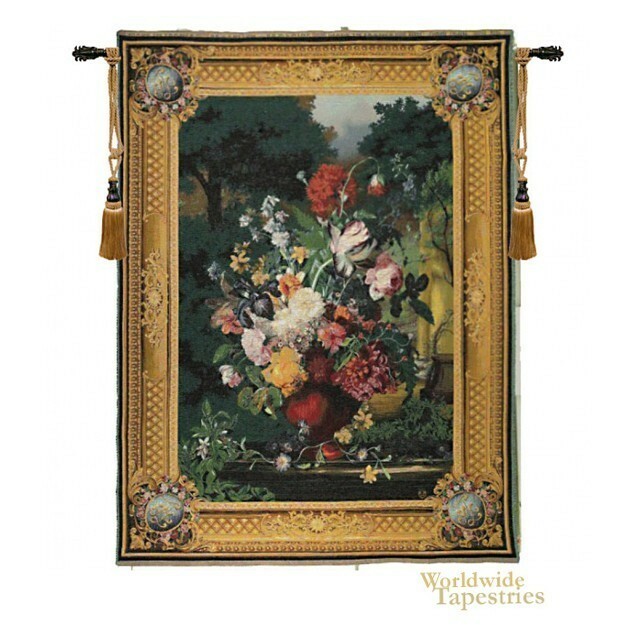 Grand Bouquet Flamand tapestry shows a large urn of flowers in a garden scene of green trees. Filled with the beauty of nature, this piece shows the beauty of flowers as a still life, with a landscape scene as the backdrop to enhance its beauty. This was a technique used by French still life artists for centuries as they created tapestries for the decor of royal residences. Full of beauty, this French floral tapestry "Grand Bouquet Flamand" is backed with a lining and has a tunnel for easy hanging. Note: tapestry rod and tassels, where pictured, are not included in the price.